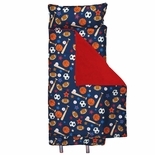 Monogrammable Girls and Boys Nap Mats Sleeping Bags by Stephen Joseph for Preschool, Kindergarten and Sleep Overs. What little girl and boy doesn't love Stephen Joseph nap mats or sleeping bags monogrammed with their name? 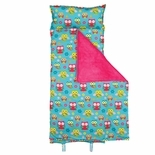 Stephen Joseph Nap Mats are perfect for day care, preschool, kindergarten and sleep overs. 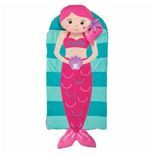 You can choose from character nap mats such as a princess, cupcake, butterfly, unicorn, shark and pirate or nap mats with fabric that have robots, sports stuff, mermaids and princesses all over. And, when your little one isn't using it, it rolls up and can be carried with straps on the back like a back pack. Sure to be your child's favorite thing to take to school!